Founder of Love Dogs, Malene W. Jorgensen, is first and foremost a huge dog lover and she considers this to be the most important ingredient when dealing with dogs on a daily basis. She grew up with dogs (German Wirehaired Pointers) in her family home and have always had a great affection for these animals. She believes it is vital to have a calm, positive energy as a dog walker/ dog sitter and to always make sure that the dogs feel secure and loved at all times. To her, dogs are like family members and should be treated as such, thus looking after all her four legged friends with genuine care and affection, plus providing all clients with a top notch professional service. 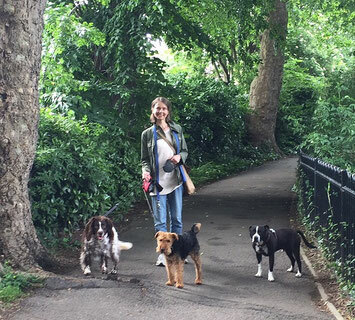 The dog walking services take place locally in Herne Hill and Dulwich Village, South London, primarily in Brockwell Park, Dulwich Park, Belair Park and Ruskin Park - all parks that Malene is very familiar with as she has been a local resident in Herne Hill since 2003. 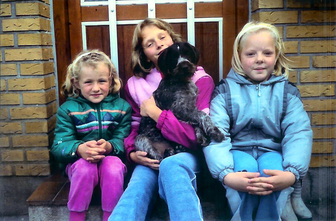 Malene (in the middle) with the family puppy, Bella, back in the lovely 80s!